I’m an odd bird (in more ways than one), but sometimes I actually crave the consistency and routine of the workweek. It is so nice to know what your schedule is going to be (food/exercise-wise, not necessarily while AT work!). So since I can easily plan what and when I’m going to eat during the week, I try to use Sunday nights as my “prep night”. This is usually only for lunches, as dinners are usually prepared by both my husband and I (yes, he’s amazing and helps me cook!) and we can’t ever decide what we want until that day! …I think you’re seeing the trend here. Basically a protein, a whole grain (1/2 cup to 3/4 cup), and veggies. Since I try to bring my lunch 4 out of the 5 workdays (or 3 out of 4 if it’s my Friday off), it’s easier to prep my food all in one night, divide it up into containers, and then just grab and go in the mornings! Sunday mornings I’ll run to the grocery store and grab the essentials for the week, then come straight home and spend maybe 30 minutes or so on my prepping. That’s IT! First, I dice up all of my veggies into chunks. My go-to veggies include squash (duh! 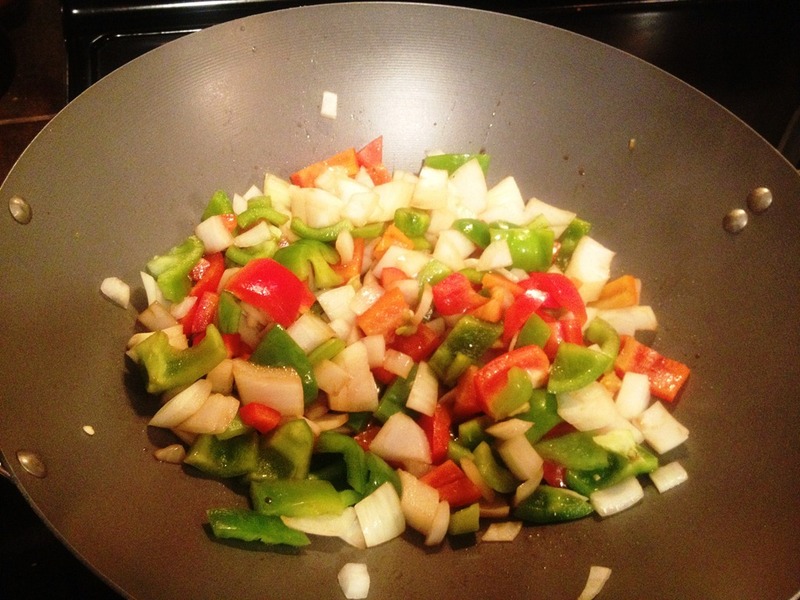 ), zucchini, bell peppers (of ALL colors! ), onions, snap peas, carrots, and occasionally broccoli and broccoli slaw. I then throw them in my HUGE wok (thanks, wedding registry!) and sauté away! I try to use as little olive oil as possible, but some is necessary to get a good sear on them! A lot of times I’ll add a little low-sodium soy sauce to give it some flavor (actually, I do this MOST of the time!) The result is a LOT of veggies! Next comes the protein! 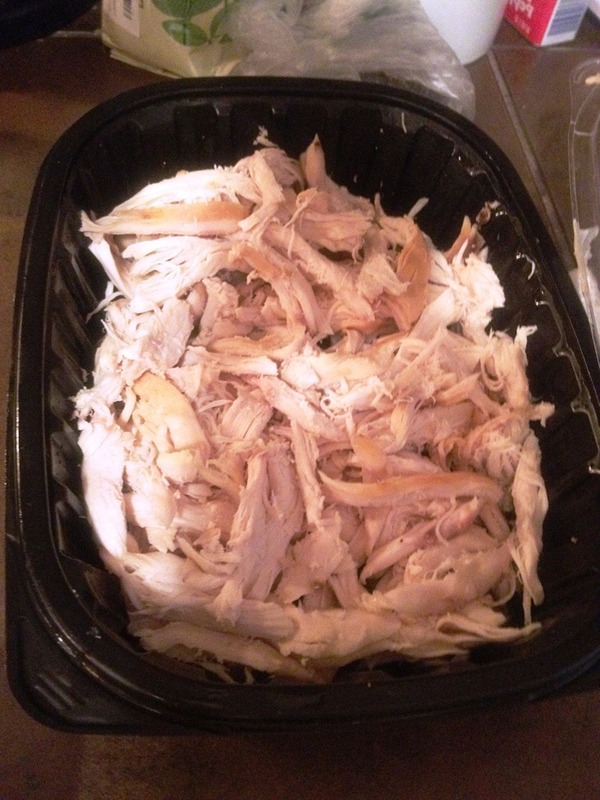 9 times out of 10, I can sucker my husband into grilling me chicken on the outdoor grill, but this time he was feeling a little under the weather, so I grabbed a rotisserie chicken at the store and he gladly ripped it to shreds for me . Next, I boiled a pot of water and cooked up some quinoa (my grain of choice for the week). I usually do about 1.5 cups of dry quinoa to cover 4 meals. Then…VOILA! All done! I pack it into 4 separate containers, pop them in the fridge, and enjoy the rest of my Sunday! Some people find it hard to eat the same thing every day for lunch, but to me it helps me stay on track! It’s also nice to not to have to worry about what I’m going to bring. Also, I always leave at least one workday where I can go out with coworkers and eat lunch with them, so as not to be completely anti-social . 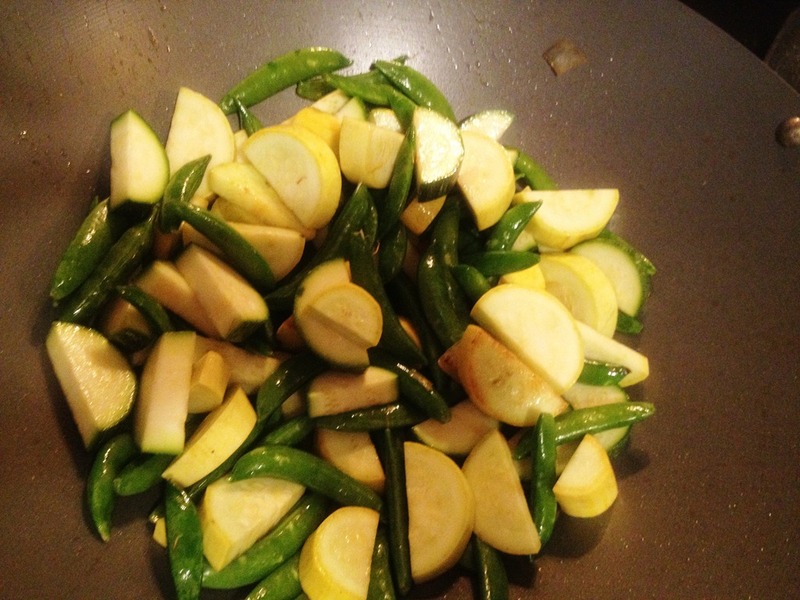 A side note: the TONS of vegetables that I sauté are definitely not just used at lunch! Preston and I incorporate them into our dinners too. 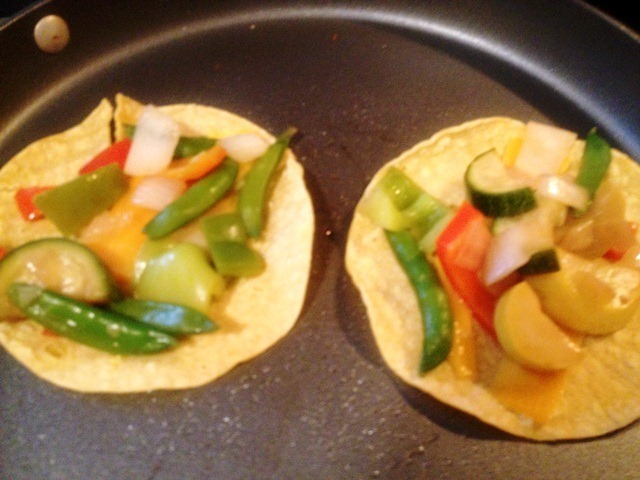 Check out these yummy veggie tostadas we whipped up for dinner tonight! Do you have a “Sunday night prep night” as well? What are some of your favorite bulk meals to whip up?